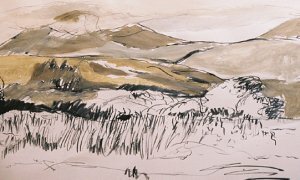 The following story appeared in the Ileach Newspaper: The Jura-influenced artist is to exhibit at ICCI and told the Ileach: “I have loved Jura all my life. I was brought as a baby, brought friends as a student and now come in the holidays with my own children. “All my childhood summers were spent there and it is a place where I have long genetic roots through my father. My memories are of milking with Mary and Annie Darroch in Knockrome, homemade butter, bringing in the cows with Sandy, stamping the hay summer by summer with my sister and brother, and even singing in the Wee Free…. The exhibition runs 17th July – 5th August.